We all get them dropped off one (or more) times every year — big, thick phone books. But what to do with them now that we just look up phone numbers on Google or we have them stored in our cell phones? Here are some creative uses for phone books our readers came up with for phone books – actual, paper phone books. Stack them under the table cloth to elevate a nice centerpiece. Bullet-proof your house! Build 6-foot book shelves along all exterior walls within your house and line them with phone books. They make the best bullet stops there is, and it makes you look like an intellectual.when people stop by. Another option to do build these “bookshelves” alongside the front and back doors. It’ll give you something to duck behind when you have unwanted company…with guns. Stack them to create a make-shift booster seat. Wrap Christmas decorations and other fragile items to protect them in storage or shipment. Wrap compost in it to carry to the bin, then just throw the whole thing in so you don’t have to worry about washing a dish or bucket out. Coat pages in petroleum jelly. Roll them up and dip them in wax. Makes emergency candles that are also waterproof. As a teenager I would use them as scrap books. Cover them with all kinds of art. You can pack them in a box or wrap them up together for a safe backstop for dry fire practice with a gun. Tear out a few pages and stuff them into empty toilet paper tubes. Great firestarter. Tear them up and use them to smother weeds, putting mulch on top. Works better than the black plastic stuff, and the best part is that they degrade completely. Use with this awesome tool to never run out of seed pots! Using a phone book for its intended purpose is better than a smart phone. 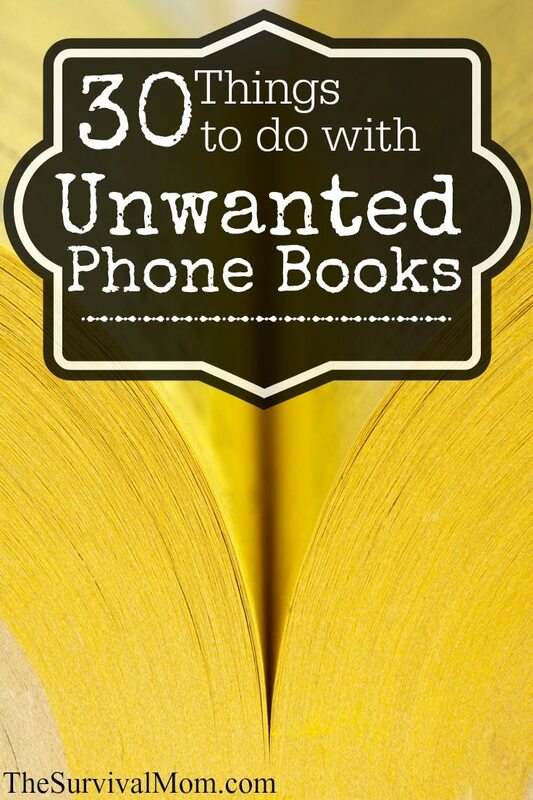 The phone book gives you more choices and you’ll always have it handy. Use a PostIt Note to bookmark pages you use most often, and if your eyesight isn’t the best, keep a magnifying glass handy! I use them to protect the table while I glue my paper craft items together. Just open the book, do the gluing, and leave the project to dry. If any glue seeps out, just tear out that page and you still have lots more. i work in theatre, often looking for props. I had the hardest time finding a phone book for a play set in the ’70’s. You may want to consider donating old phone books to your local theatre! Also alot of phone companies have the mini version of them when i worked construction my bosses always had the current mini versions in their trucks for #’s they didnt have readily available in their phones on the job. Often came in handy found myself doing the same for a while. Good thing to have if you have a door pocket thats something that’ll fit there and as mentioned a good reference for #’s you cant find via just the phone itself. Give to a parrot to shred, they love them. When my son was about 4-5 he loved looking at the yellow pages, so my mother cut out pictures of cars and trucks and pasted them in one so he had some colorful pictures to look at too. This was back in the 60’s when we had yellow pages and white pages books.